Surgeons and anaesthetists may have spluttered cornflakes across their breakfast tables yesterday. “Wasteful NHS delays 1 in 3 operations”, yelled the headline in The Times. “300,000 extra operations could be carried out every year if surgeons planned holidays and lists better”, snarked the headline in The Telegraph. Perhaps they should start reading the sympathetic Sun instead? It took a much more positive tone… and who’d have thought that “6-4-2” theatre management processes would ever make it into a subhead in the Sun, of all papers? 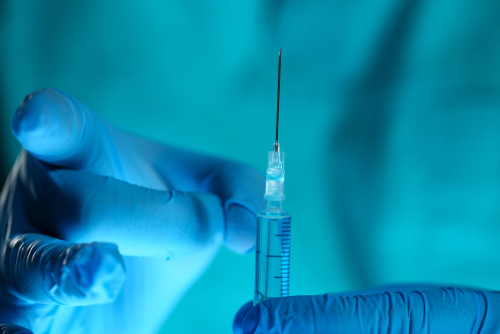 All of this fuss surrounds a much-delayed NHS Improvement/GIRFT report, involving Deloitte and the Royal College of Surgeons, which analysed all the elective operating sessions at 92 trusts during 2017. There is much to like about this report, and the authors have been canny enough to avoid falling into traps like assuming there is always a tiddler to pop on the end of any theatre session, that slower surgeons can just work faster, or that theatres are immune to pressures elsewhere in the hospital. Are half-day sessions really better? with the implication that all day sessions are less efficient. This is not our experience, and on looking more closely at the chart I am not sure it is a valid conclusion from their data either. Let’s start with early finishes. 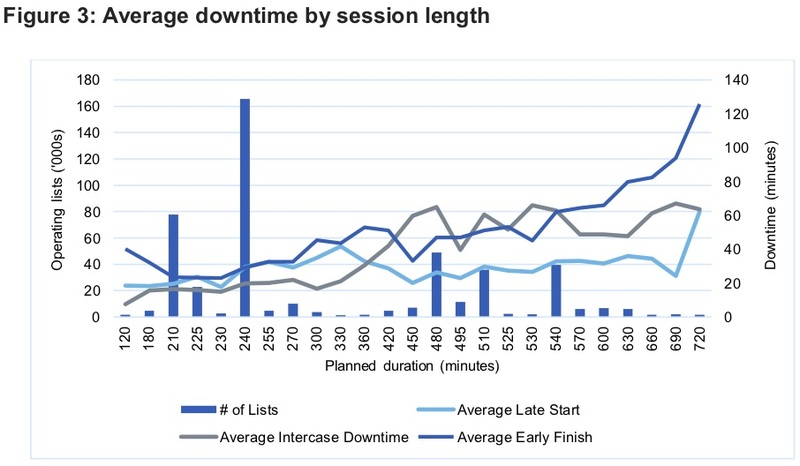 Looking at their chart, the average half-day session finishes about 30 to 40 minutes early, while the average all-day session finishes 60 to 80 minutes early. So when you add two half-day sessions together to make a full day of work, you end up with a similar loss of time over the day. The advantage of a half-day list disappears. Finally there are the late starts, which run at a steady 30 to 40 minutes on average across all session lengths. Which means that if the day is split into two half-day sessions, then on average there will be two late starts instead of one. So it seems that all-day sessions come out better after all. And that is what I would expect; although we have not covered nearly as many trusts as the NHS Improvement study, or even attempted to gather our findings systematically, our visualisations go beyond the numbers so you can see in more detail how theatres have been operating. And on the basis of what we have seen in hospitals around England and Scotland, all day sessions just seem to work better. Here I’ll outline how Gooroo Planner provides advanced analysis and visualisation to help with this. There are two stages to planning elective activity around the peaks in non-elective bed use. The first is to agree the acceptable risk of running out of non-elective beds and convert that into a bed occupancy for planning purposes; we can do this analysis for you now. The second is to plan elective inpatient activity automatically around the peaks in non-elective bed use, and to plan daycase activity around the peaks in elective inpatient theatre use; this is built into Gooroo Planner, so you can use it to create a holistic plan for the whole hospital through the seasons. In addition to the valuable suggestions in the report, Gooroo Planner can further enhance patient scheduling by protecting clinical priorities and minimising routine waiting times. So when you are enhancing your booking team’s ability to pack a good theatre list, you can ensure that they also improve clinical safety and waiting times performance. Gooroo Planner includes visualisations that give you a far richer picture of what is happening in your operating theatres, all the way from patient level detail, through the whole week in one view, to control charts covering the late starts, early/late finishes, and turnaround times described in the report. In our experience even this depth of analysis seldom provides definitive answers, but it does help you ask the right questions of the right people (and know who to leave alone). Demand and capacity planning is Gooroo Planner’s core functionality. It can plan the whole hospital in one go, with elective and non-elective together, and plan waiting times along clinical pathways. If you don’t already have Gooroo Planner and this sounds interesting then please get in touch and ask for a free on-site demo.